Dusty African winds may blow some good to the storm-battered United States: Dry air carrying Saharan dust westward from Africa may interfere with hurricanes forming in the Atlantic, a new study suggests. 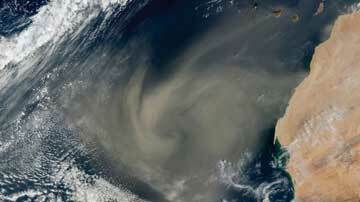 A giant dust storm blows off the western coast of Africa into the Atlantic Ocean. Such plumes of African dust may have a dampening effect on tropical storms forming in the mid-Atlantic Ocean. Image is courtesy of NASA/Amato Evan. Scientists have known for centuries about the large plumes of dry, dusty air, called the Saharan Air Layer, that can sweep out across the North Atlantic Ocean during the summertime, says Amato Evan, a climate scientist at the University of Wisconsin in Madison. Storms in the tropical Atlantic, meanwhile, form within a lower-lying layer of moist air that is conducive to tropical convection, or storm growth, Evan says. The moisture is a necessary ingredient to feed the storms’ fury. Although climate researchers have become increasingly convinced that the Saharan Air Layer is interacting with the storms forming below, exactly how they are interacting has been unclear. Both the warm, dry air and the dust in the Saharan Air Layer could help break up a gathering storm, Evan says: The dry air can interfere with a storm’s surging updrafts, which transfer heat and moisture upward and help form the compactly circulating column at the storm’s center. The dust, meanwhile, can absorb heat and thereby warm the upper atmosphere, stabilizing the churning environment. Armed with a new algorithm he developed that is able to distinguish dust from clouds in satellite data, Evan and his team compared satellite images of dust storms on Earth with storm records from the National Hurricane Center in Miami, Fla., during the heights of the hurricane seasons from 1982 to 2005. “It’s the longest and most continuous satellite record of dust we have,” Evan says. What the team found was “a robust link” between the years with elevated dust activity and fewer hurricanes, as well as the years with less dust and more hurricanes, they reported in the Oct. 10 Geophysical Research Letters. Two standout years for hurricane activity, 1995 and 2004, were also the lowest in Saharan dust throughout the record. For the 2005 hurricane season, which broke records in the Atlantic, however, dust activity was moderate, indicating yet another level of potential complexity to the dust-hurricane interactions, which the researchers are continuing to investigate, Evan says. During that year’s hurricane season, the researchers noted an increase in dust from the African coast, and a dearth of hurricanes forming in the middle of the Atlantic. Instead, they “kind of got pushed closer to the United States,” he says. Therefore, an indirect effect may also occur, in which the dust may dampen storm formation in the middle Atlantic, but not prevent them from forming farther west. The study confirms what many in the climate research community are already beginning to think: that there is mounting evidence that the dust may hinder hurricanes, says Natalie Mahowald, a climate scientist at the National Center for Atmospheric Research in Boulder, Colo. Evan’s team’s study provides “a much more quantitative estimate of the extent of dust than we’ve had before,” which may help draw more attention to the problem, she says. But to be useful to actual hurricane season predictions, scientists will need to move beyond the observations and into modeling, to understand how the dust affects the storms, she says. Icebergs breaking apart in the Antarctic may be responding to sea swells kicked up by storms on the other side of the world, a new study shows. The connection suggests a new factor that could help alter the mass of the Antarctic Ice Sheet and possibly help induce abrupt climate change. 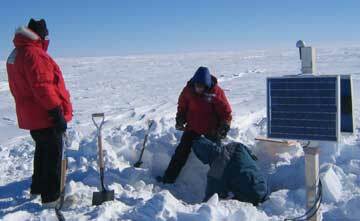 Doug MacAyeal and his team dig out a seismometer buried in the snow on Nascent Iceberg, part of the Ross Ice Shelf. Sea swells stirred up by storms thousands of kilometers to the north appeared days later in Antarctic seismometer records as low-frequency signals. Photograph is courtesy of Doug MacAyeal. Scientists discovered the connection while recording Antarctic iceberg “songs” — tremors in the ice that can radiate across the ocean for “extraordinary distances,” says Doug MacAyeal, a geologist at the University of Chicago in Illinois. Seismometers mounted on both icebergs and on islands in the South Pacific to record the songs were also picking up other signals: They were recording low-frequency motions within the ocean’s surface, such as sea swells and tsunamis. To trace the origin of those sea swells, MacAyeal and his colleagues compiled seismometer data from 170 days during the Southern Hemisphere’s summer months in 2004 and 2005, corresponding with both the winter storm season in the northern Pacific and the southern Pacific’s typhoon season. Comparing the frequencies of the waves picked up by the seismometers with the waves’ arrival times, the team was able to estimate how far across the ocean the waves had traveled and when they began their journey. Some of the strongest signals in the Antarctic iceberg data matched up in time and distance with large storms raging thousands of kilometers away in the northern Pacific, the team reported in the Oct. 10 Geophysical Research Letters. Seismometers based in Antarctica’s Ross Sea picked up swells that had originated near Typhoon Olaf, a Category-5 storm that passed close to the Cook Islands in the South Pacific in February 2005. Another set of swells could be tracked back to a large cyclone in the Gulf of Alaska in October 2005, they found. The swells originating from the Gulf of Alaska storm may have materialized in more than the seismometer data, MacAyeal’s team suggested. About 12 hours after the swells were recorded in the Antarctic seismometers, a large Long Island-sized iceberg called B-15A broke off and drifted away from the Ross Ice Shelf, eventually grounding on shoals and breaking apart. Due to the timing of the event, MacAyeal’s team speculates that the iceberg’s activity may be connected to those swells, which may have caused vibrations in the ice that resulted in fractures, or may even have pushed it onto the shoals. How much power the faraway sea swells might have to actually shake up icebergs and induce calving is “the part we’re still not clear on,” MacAyeal says. But with “global storminess likely to increase,” he says, the question is potentially important in the context of climate change. Sudden releases of flotillas of icebergs into the ocean, such as the so-called Heinrich events during the last glacial period, can dump freshwater into the ocean and help alter its circulation, causing abrupt changes (see Geotimes, November 2006). The team’s finding is “significant,” because it identifies another possible contributor to changes to the Antarctic ice sheet mass, says C.K. Shum, a geodesist at Ohio State University in Columbus. The sea swell-iceberg connection, as well as other researchers’ investigations of the impact of warm ocean currents on the ice mass, could help explain a lingering discrepancy between how much of the ice sheet has melted and observed global sea level rise, he says.